in watching the oil pressure on my XFI, I saw that the oil pressure dropped when coming to a stop. While I had the oil pan off, I first noticed the pan was open and had no baffing at all. I am wanting to either add the baffling to this pan or get a deeper pan so the oil does not uncover the pickup as much. Just get a RJC pan and be done with it. That is one way I am going to stop this. Do you know the distance between the bottom of the pick up and the bottom of the oil pan? 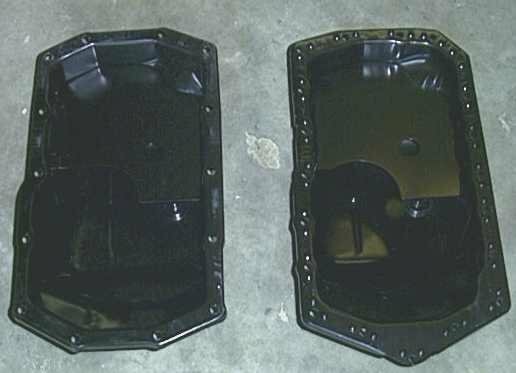 There are two different depths of oil pans which means there are two different length pick ups. When you run a deeper pan you still want to run 5 quarts of oil as the purpose of the deep pan is to get the oil farther away from the crankshaft. Dropped how far? You sure you're not a quart low? A stock pan with the baffle in it is going to be plenty. The RJC pan is a nice piece, but it hangs below the crossmember and that makes me nervous. Correct, my indirect point was that he could find a stock pan with the baffle and not worry about cracking the pan open on a piece of road debris and probably save a few bucks over the RJC unit. But I didn't want to say that out loud because I like the RJC guys and didn't want to look like I was poo-ing their pan. My RJC pan has is baffled, sadly yours is missing I wonder if you can send it to RJC and get one installed . It has an external filter and turbo saver on it so it holds 6 1/2 quarts to get it where it says it is full on the stick. So the stock pan is supposed to have a / some baffling ? First time in a 3.8 buick when the head gaskets let go so was now sure if it was to have any. When coming to a stop, it will drop from 22 pounds to nine or so. When I get it off, I will take pictures. I may be wrong, but IIRC, only the turbo cars got baffled pans. Your pan may be from a N/A engine. It may have been. I have found many surprises with this car. In someones wisdom I guess they thought it would make it faster. When I built my 4.1 I made a baffle out of a Sony VCR lid. You can still the ''Y'' on my baffle. Nothing to it. Seems to me the baffle is more for hard take offs not hard braking. A must have for a drag car but not sure it will help with hard stops at .7 g and more. That's not the point. To uncover the oil pickup the oil has to go somewhere else ie slammed to front of the block right? Maybe he's not uncovering it at all and some other event is occurring or is bogus data to start with.